If you follow your Google Analytics carefully (and you should), you will probably be horrified and dismayed by your site bounce rate. On the average blog, a bounce rate of 60-75% isn’t uncommon. That on the surface appears to be terrible. I remember thinking that there must be something seriously wrong with my site if 70% of people arriving went on to leave ‘instantly’ without reading anything or engaging in any way. Or at least that’s what Analytics was telling me. And the average time spent on site was a mere 2:30 to 3:30 minutes per person. So if 70% of people were leaving immediately and of the rest of them, the average time spent was only around 3 minutes, I was wondering what was so bad about my site and it’s content that readers really were clicking away in their droves! It didn’t seem right somehow, compared to the comments, emails and number of video views I was getting. So I did a bit more research into how Analytics works and how Google calculates our bounce rate. What I found was very interesting and I think you’ll be so relieved when you realise how these figures aren’t what they seem. Google measures your time spent on site as the length of time between arrival and their last page view. Here is where the flaw becomes obvious. Scenario 1. A reader arrives from a search engine, lands exactly on the article they are looking for and reads the post carefully for 15 minutes. Then they leave, satisfied and happy to have their question answered. Google interprets this as – you guessed it – a bounce. Time spent on site is ZERO – no minutes and no seconds. Because the time between their arrival and their last page view was no time at all. They only read the one page. GOOGLE FAIL. Scenario 2. A reader arrives and finds what they are looking for, reads your article for 2 minutes and then follows a link within that article to another post on a similar topic and spends 10 minutes on that page, then leaves. Google interprets this as time spent on site = 2 minutes. Just the time from arrival to the last page load. They don’t count the 10 minutes the reader was on the second page at all. In this case the reader isn’t recorded as a bounce, but the time spent on site is seriously under-calculated. Another GOOGLE FAIL. “Bounce rate” in Google Analytics is one of the key metrics that helps to evaluate the quality of your traffic. “Bounce” happens when the visitor exited the website right from the landing page, without going to any other page. This is a great indication on how relevant the content was for the user and how engaged they were with your website. So your bounce rate helps Google to ‘evaluate the quality of your traffic’. Basically it tells them how engaged a reader was with your site, how much they liked it. This is important if Google sends you search engine traffic. Their algorithm checks to see how many times your site was displayed in results for a search term, how many times it was clicked and then also checks how long the visitor stayed on your site and their engagement. These checks help to determine if your site provided the answer the search was looking for – were you relevant for that search? If their tracking shows that you had a high bounce rate or low average time spent on that page by search engine visitors, they may determine that your page was not very relevant to that search term and may drop your page down the rankings, favoring pages with lower bounce rates. Yikes! Google recognises that the model they use doesn’t suit all websites or provide blog owners with the full and accurate picture. They admit that any visitor, no matter how long they stay, will be considered a bounce and the time recorded as 0:00 if they only visit one page. With blogs being set up so that each of our posts or articles is a single page, and each article is often an in-depth article in its own right, sometimes a reader immediately finds what they are looking for on our site and doesn’t need to go anywhere else. They might spend 10 minutes thoroughly reading our article, but so far as the standard time on site and bounce rate metrics are concerned – they are a bounce. This will now ‘ping’ Google every 10 seconds to let them know that the visitor is still on your site, still reading your content and they won’t be regarded as an immediate bounce. Their real time on site will be recorded instead. How will this change your numbers ? I implemented the code one afternoon here on Moms Make Money and saw the bounce rate start to drop immediately and the time spent on site start to rise. It was working! After a few days, you can see the very dramatic results and the change in my numbers. It now gives me a much more accurate picture of how long readers spend on site. Of course there hasn’t been any change in reader behaviour, but at least now Google and I get a much more accurate picture. Previously at Moms Make Money, it appeared that around 75% of my readers were bouncing – leaving immediately they arrived, and the average time spent on site was around 3 minutes. Now I get to see a much more accurate picture that my bounce rate is actually just around 15% and the average time spent (well, it varies) can be as much as 22 minutes per visit! This is what my visitor engagement looked like in January before the change. Shows most of my visitors as being there less than 10 seconds and bouncing (not true!). And this is what it looks like today with the more accurate information. Shows that those readers spend a lot longer on site. The biggest bar there shows that the highest number of visits come from readers who spend more than 30 minutes on the site. Thank goodness! I thought I was scaring people off, but it turns out that’s not true at all and my visitor engagement is much higher than I thought. Interesting? What do you think? Do you know what your visitors want to see? Wow! 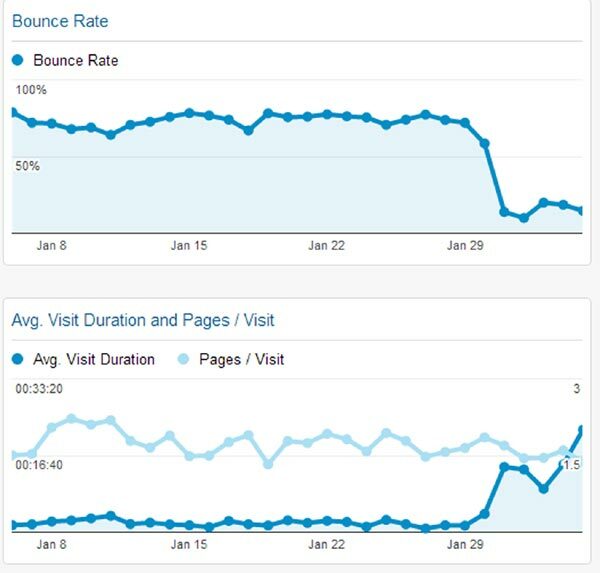 I honestly never understood bounce rate and felt something wasn’t right. I’ll be adding that code tomorrow. Thanks so much. I stopped over from the Titi Crafts linky. It certainly opened my eyes! Google has flaws in tracking the visitors in more ways than one. I use Clicky these days. If you need to track more sites, you need to pay, but I get a lot more info and decent bounce rates. I added it…very interested to see how it works. Thanks! I read an article about bounce rate saying a high bounce rate wasn’t all bad. The way it was explained was that if a person does a search for a piece of information on the web, finds your site, it is exactly what they need and then they leave your site, you will end up with a high bounce rate. However, this isn’t all bad, since you gave the reader what you he/she were looking for. The only drawback is they didn’t spend any time looking around your site, though. I will have to look into installing that code on my site. My stats (albeit smaller) look very similar to your befores. OMG Debi this article answered so many questions and I have just modified my footer.php so I can’t wait to see how me bounce rate changes.. fingers crossed here!! Thank you so, so much for the information Debi!! I’ll have to try this out. Thanks! “After doing a quick search on the internet this is what I found out, you need to retype the quote marks because for some reason for some of us they copy over in italics. flexines: Where are you supposed to add this code on your blogger blog? I don’t have a php file, so I’m not sure where to copy and paste it. Thanks! Glad you wrote this…I added the code 6 days ago and noticed nothing changed. I just did a closer look at the code on my site and what you described is exactly what happened to me. I had to remove a set of extra quotes and then replace a few others correctly. Here’s hoping I start seeing changes!!! Thanks for posting about the quote marks, I was having this same problem! Blogger wouldn’t even save the changes for me with them as is. Hi Divya. I don’t know if it will work for other sites. You may need to install it somewhere else if your site is not WordPress, but I don;t know enough about other sites to be able to advise you on this. And you are right, like I say in the article, it doesn’t change your readers behavior at all, it just gives you more accurate information on their true behaviour. I’ve had it installed now on both of my main sites for some weeks, and although there are small daily fluctuations, neither of them have gone back up at all. Both are still hovering around 10-15% bounce rate and my time spent on site is more than 20 minutes for MMM. I tried everything to lower the bounce rate, nothing worked, and now I know why! I was just looking at my bounce rate today and thinking “OY I’m in trouble!” I’ve put the code in (hopefully in the right place) and pinned this so I can share it and come back to it again! Thank you! Do update us with how your numbers change. I feel so glad that I was ‘misled’ by the numbers and people aren’t all immediately leaving like I thought. I feel so much better about the site now. Great information…followed directions and waiting to see what happens. Thanks for sharing! Thank you so much for this! My bounce rates were similar to yours, but I felt as you do, people are reading and commenting on one particular article and leaving. I’ve tried adding links to “see more” on the sidebars to get folks to stay, but I still have a high bounce rate. I do feel honored that I’m helpful, they find what they need and then don’t need to stay. And frankly, how many of us have to time to linger on one blog for extended periods of time? I’ve installed this code (I’m on blogger, so we’ll see if I did it right 🙂 ) and hopefully I will see more accurate results. I’ve pinned this for all of my other bloggy friends. Just wanted to follow up – I instituted this code yesterday, and already my bounce rate is down to 35% from 69%. Page view time is up from approx. 2 min (similar to yours) to 7 min. I’m also getting a better picture of reader engagement. Thank you so much for figuring this out and sharing and giving us a more accurate representation of what is REALLY going on with our sites!!!!!! This is really interesting… I’ve been so confused about my bounce rate recently. My rate used to always be in the 70s but in the last maybe four-five months it has been around 5%. I don’t understand how it could have changed so drastically. My average visit duration is still low (like 2 minutes), so I really don’t know what’s going on with my analytics. I thought for a while maybe they had completely changed what bounce rate meant, but I guess that’s not the case. you might have your analytics double installed if your bounce rate is something like 5%. Hi Deby! Thanks for this information. I am on blogspot. I can easily see my “stats” but I don’t recall seeing “bounce rate” as a stat. Is Google Analytics something more advanced and how to I see that? I put this code in today, and now Comment Luv can no longer fetch data from my site. Maybe it’s coincidence. I removed the script to see if I continue to have that error. Just a heads up in case this is something that actually does interfere with Comment Luv, as I know many sites (such as SITS Girls) uses it. I think that must just be a co-incidence because I’ve had it on my main sites for 3 weeks or more now and have had no problem with picking up posts for Comment Luv. Do report back though Stephanie and let me know what you find. Assuming its in the right place, I don’t see any reason why it would interfere with that. I just added the code to CraftsCrazy. I can’t wait to see what my real bounce rate is! Thanks very much for commenting and for sharing Dawn. It was a huge sigh of relief for me when I realised things weren’t as bad as they first appeared. If you get a chance in a couple of weeks, maybe drop back and report on what you found? Do you know if this will work with Stat Counter as well? No Kate, this is purely a script to work with Google Analytics. The visit length in Statcounter is flawed in the same way, but this doesn’t fix that one. Glad to see what this really means. I usually don’t take bounce rate or analytics too stressfully. I tend to notice when comments start coming in and that lets me know that people are sticking around. Your discription off this problem was smack on. I knew that the visit length was inaccurate but I did not know that the bounce rate was inaccurate as well. Wish I knew enough about code to insert. My bounce rate hovers around 50% and I’ve always thought that couldn’t be right as I juxtaposed that rate with traffic and behavior. Thank you for this information. Never really understood the bounce rate. Your post makes it so much easier to understand. Now I just need to add the code and hopefully see a big change. Thanks for the code. Thanks so much for this! I’ve been rather “fortunate” I suppose in that my bounce rates are usually between 3% and 12%, I don’t recall having them go much higher than that. I installed the code though too because I would love to see what is *really* going on with my readers and how much time they are actually spending on site. I know that they have to be here longer than the 10 second majority lol! Wow Kim, that’s some awesome statistics on your bounce rate. You must have some great content and great site architecture that encourages your visitors to visit more pages on your site. Would you post a link to your site so we can all take a look and learn by your example? Sorry I didn’t get back to you sooner Deby! I was at the skate park with the kiddos! Now my newsletter bounce rate … that’s a different story lol! Very interesting post. I’ll have to investigate mine a little more, though I typically run around 30% I’d love for it to be better. Thanks for all of the awesome information! This is so great! I just added it to my site, and I’m interested to watch my stats and see if it makes a difference. Thanks so much! This is awesome! My bounce rate is always CRAZY high and I didn’t get it either. I am so gonna have to try to install that code so I can get a more accurate look. Thanks for the info! Off to save my template! This possibly the most amazing & helpful blogging article I’ve read in a while. I’m excited to try it out – thank you! Wow, thanks Mary Ann. Your comment means a lot to me and I’m so glad you found this interesting. Hi, did you happen to try this out on your blogger blog? If so, can you tell me where you entered the code? Thanks! Hey Laura, I haven’t tried to do it yet. I wasn’t exactly sure where to put it and it was late when I was trying so I thought I would wait until I have more time and well… I have forgotten about it actually. If I try again and figure it out, I will let you know. For the first time in a long time I just took action while rereading a blog post! Code is loaded and I;m looking forward to seeing my real results! Thanks so much Deby. Glad you found it interesting and useful Clare, and were inspired to take action as a result. I’m loving all the extra information I can get from all of my Analytics now that I can really see how my visitors are behaving. Great points! Does make me feel more at ease! I learned a while back not to mess with my CSS; I totally killed my site and was very lucky to get it back. I will have to find a developer that can do this for me because it would be EXCELLENT to have. Thanks! Hi! I just added that code and looking forward to see how the stats will change! This was very very informative…thank you so so much! Put mine up tonight! Will keep my eye out on what happens. Thanks for sharing and finding this out. Any ideas on how to enter this code on blogger? I would love to implement this and see what it does for my bounce rate – my rate is terrible! I entered it but it hasn’t changed….still watching…. ok! Going to try this! Thanks for sharing!! Great great post on an often overlooked and misunderstood topic! Thanks for the overview, details and code fix! I’m totally going to go try that right now. I just have 1 big question for you: Why doesn’t Google itself add this code to analytics to solve the problem?!?!? Who knows how Google think! They are a mystery all to themselves. Thank you for explaining how that works! It makes a lot of sense, as the actual page loads are the only things GA has to “count” from. I’m wondering, though…if you install the code to ping Google every 10 seconds, will it not begin to use a lot more system resources and potentially cause problems with your host? I like the idea of getting more accurate numbers, but I’m a bit nervous about installing a script that runs repeatedly like this. That’s something I really don’t know about. I guess if you had a lot of visitors perhaps it could add up, but I’ve not read in any of my research of any issues. Good to bring up the possibility though. I’ve always felt that the bounce rate on my site seemed really inflated. Like you mention you could tell from the comments and visits that people had to be staying longer. I can’t wait to see how this code changes what Google Analytics is reporting. Thank you so much for this! I’m in the same place you were. I knew something just wasn’t right but I couldn’t figure out what was wrong! I’m going to try this trick immediately! Thanks again! Thank you so much for this tip! I just implemented and can’t wait to see if there are changes. I hover around the 75%-80% mark normally according to google, so I’m eager to see if this drops that number. I’ve pinned and I’ll try to comment back after a while if I see change. This is for wordpress right? How do I implement this code into blogger? Exciting! Hi Sarah. If you look through the other comments on this post, there are a couple from Blogger users which should give you the info you are looking for on how to add this to your Analystics for Blogger. Sorry, I don’t use it myself, so I can’t say from my own personal experience. My change was obvious within 2 days, and now the graph is pretty flat at the new bounce rate and new time on site. Hi Deby! I installed it weeks ago and nothing has changed. I have a wordpress site and put it in the footer as instructed but no changes to the bounce rate…what could I have done wrong? In added the code right before the closing tag so don’t think I did something wrong…your instructions were pretty simple…anyone else install it and see no change? I’m curious?? thanks! There were some earlier mentions I think from a couple of people to say they hadn’t seen a change. Providing its installed correctly, and you didn’t have this set up before somewhere, then I’m sorry but I can’t explain why your rate hasn’t changed. I’m no coding expert and the ins and outs of Analytics is a bit of a mystery to many outside of Google! 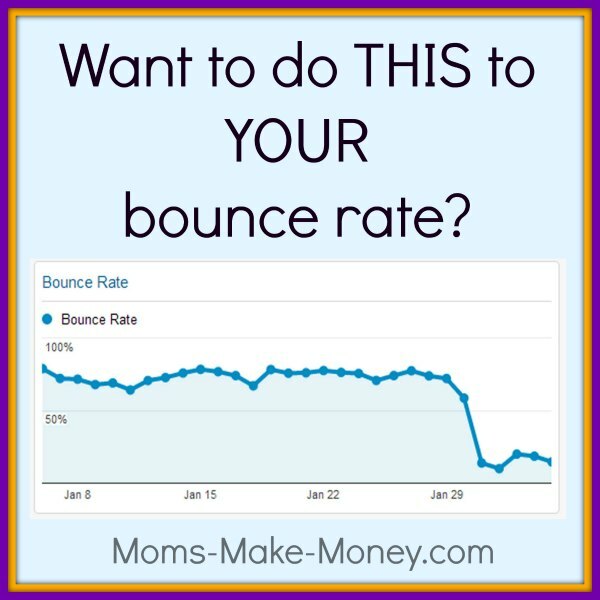 Maybe you already had a great bounce rate and that’s why? Thanks for this code, I have already added it to one of my sites but now I am going to see if it works with blogger. Fingers crossed! (I hope it does work as Blogger has a 80% bounce rate)! Thank you so much for sharing this!! I have it pinned! What if people just stay on site and open new tab where they continue browsing? We implemented this code yesterday and only on 1 selected page on entire site and today I checked data and it’s just not possible people would stay on page over 60 minutes. is it somehow possible to limit session duration becasue under this code session is probably not limited anymore on 30 minutes? I’m sorry I didn’t write the code or know how to make specific changes to it to suit your needs. You’ll have to ask your web developer about that. But I sometimes might stay on a site a long time. Perhaps I’ll open a few pages in the morning, get distracted, leave them open and then return to read them at lunch time. So a long stay is not impossible if you looked at it that way. Once again, Thank You! I never understood any of it I’ll now! Thank you for explaining this. I am a newer blogger and I was thinking that people were not liking my content because of the very high bounce rate. My blog has a very low amount of visitors and a bounce rate of around 75% when using Google analytics. I only blog as a hobby and am not brave enough to start messing with the code but maybe someday. Thanks again! Thanks Deby! I just signed up with blogVault thanks to your recommendation. And I will be adding the code as soon as my backup is complete. Thanks for the insight. I’m a new blogger so this is a huge help and a great lesson! Your backup is essential I think. I’ve only had a couple of occasions to use it, but I was SO relieved I invested rather than loose so much work. Love the name of your site. Thank you Deby! I am so brand new to blogging, websites, etc. and your explanations were very clear and easy for me to implement. Thank you from a newbie and I am looking forward to learning more from your site! I’m so glad that I found this today. I had the same questions as to why people were leaving my site so quickly. I don’t trust myself to make the changes that you made, but if I find someone who can, I definitely see where this would help with the Google algorithm. So, way off topic, but I love reading through your comments and seeing that people misspell your name too. That being said, thank you very much Deby, for your awesome post. My community and I have been discussing this for a few weeks and this is the most helpful article so far. You ROCK! Yay, now you have a much better understanding and can see the real info on your site. Its much more reassuring now to know people don’t all just arrive and then leave immediately. There is actually a WordPress plugin for this feature, if you don’t know where to edit the footer data. It’s called “Reduce Bounce Rate” and it’s available in the WordPress Plugins Directory.